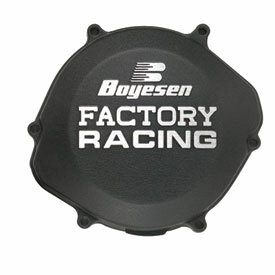 If your clutch cover is damaged or you want a fresh look, the Boyesen Clutch Cover is an excellent aftermarket option with a good balance of price, durability, and appearance. 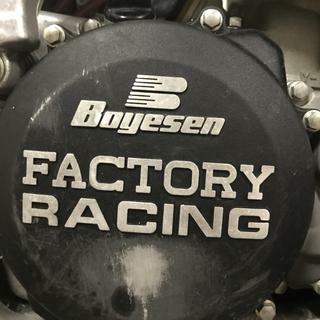 Made to be an OEM replacement part, Boyesen’s covers are made from aluminum alloy that is cast, surfaced, and then individually inspected to make sure that every single cover is up to Boyesen’s standard of quality. Put all these features together and they make the Boyesen Clutch Cover a high quality, more affordable option compared to an OEM replacement. 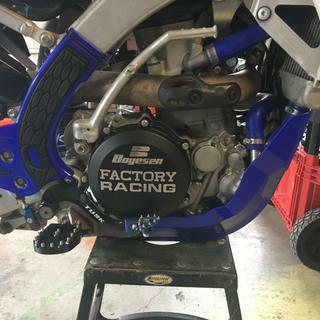 Factory Racing Clutch Covers are cast in aluminum and powder coated for long lasting performance and protection. Cast Aluminum Alloy provides solid engine protection. Durable Powder Coated Finish for long lasting protection. Individually surfaced and inspected to insure a perfect fit. 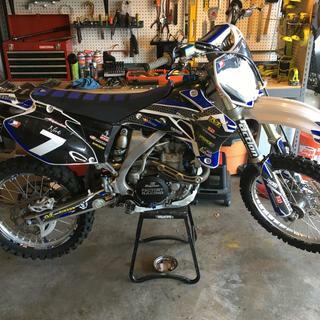 I bought this for my 08 crf250r and man did it make the bike pop. Great look and finish. Amazing quality. Perfect fit on my 2005 trx450r. Durable finish that is holding up very well and looks great! I purchased this cover to replace the OEM cover that got damaged in a wreck unrelated to rider skill level :-) Fit and Finish are perfect! looks great on the bike. Only negative is: No indication that a gasket came with the cover so now I have a spare cover gasket. Worked well, changed the look slightly, but the feel was the same. I bought this cover after cracking my oem cover. I was hoping for some durability for the price. The Finish wore off in only a few hours. Very good quality, at a fraction of cost compared to others. Very good quality. A nice way to dress up your bike a little bit and get rid of the faded/worn out original clutch cover. Installing is a breeze as long as you can use a ratchet. Would highly recommend this clutch cover. I love the look of this new cover. Fit was great. Best bang for your buck! Great product for the money , Take factory pins out if you have them or you will crack this cover . looks good and doesn't wear easy. Really makes bike stand out. Would have thought it came with gasket but not so. Great price. Good fit. Really looks awesome. Great price and holds up better to scuffs than stock cover. Looks great especially if you get an ignition cover as well. Good fit, even works over my Rekluse RadiusX clutch. I bought this unit to replace the stock cover that I put a hole in. I am very surprised that after 10 hours on the bike the black finish is not completely worn off. Back finish on a wear item is generally a bad idea, however, this unit seems to be holding up past my expectations. Fit perfect and looks great on the Kawasaki! 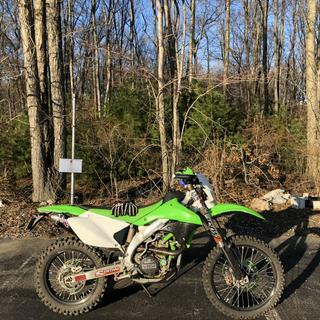 Bought for my 16' kx250f and it fit great and made the bike look much better! Gasket Leaks, but Trick Clutch Cover! This is a great clutch cover and I purchased the magnesium color. It's a very sweet looking part with really nice powder coating. I used the gasket that came with it, and it weeps a little which is my reason for the 4 star rating. I wouldn't really call it a leak, but oil does get through and the dirt sticks to it. Everything is torqued to spec and checked before every major ride. It would be nice if it was oil tight but for the trick-look of the part I can live with it. This clutch cover is excellent. The stock one would puncture very easy, but this one holds up time and time again. The plus, it looks great and gives your engine some attitude. Looks trick. Fits great. Has a oil level screw and comes with gasket. The clutch cover looked great for the first couple of weeks, but after a lot of riding it was starting to get scratched up from my boot using the brake pedal. Other than that it's a great clutch cover for the price. Looks nice, and much more robust than stock. Would have preferred an o-ring instead of a paper gasket though. No leaks, so it works fine. Looks fantastic. We'll see how it holds up. Very happy with clutch cover and ignition cover! Give the bike a nice look... Fitment was exact and came with a high quality gasket... Recommended! great price and looks pretty awesome out of the box, but after about 30 hours its not looking as good as it did. if you are replacing an existing cover this one is your best bet for the money, but my desk one will be billet. I put this clutch cover on my new 2013 KTM 450 in January, and it looks great. 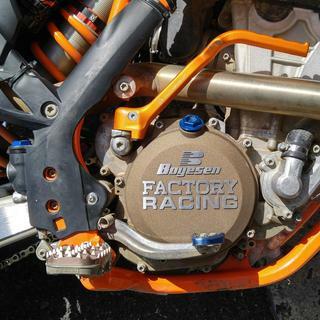 The cover is tough I have 1season at the mx track and single track the clutch cover still looks like new. The stock cover scratches in the first few rides this one is great . Stronger than stock. Looks great! I bought for my new ktm because stock is very thin and not flashy. After I got this product I was extremely impressed. I am a very very happy customer of boyesen! Looks better then stock and fixed a hole in the OEM cover. Nice replacement cover but it should have a reusable oring like the stocker. Make sure it's tight or it'll leak!!!! makes my bike look like a factory bike. Awesome. After cracking my oem cover and wanting to ride again soon. Ordered this up to get back out riding. Also ordered some quick steel, because without my buddy having some I'd been pushing my oil less bike a LONG ways. One thing I really liked about this cover is it has a real gasket. I always struggled with the oem gasket. I wish it was just a plan cover with no writing on it. But it was a fair price. And rmatv standard shipping gets to me in less than 24hrs. Boyesen products are great. I am on my second Boyesen Clutch cover now, I broke the OEM and my first Boyesen by smashing into giant rocks. They definitely hold up better than OEM and they take a few hard hits before they leak or deform. I will replace my next one with another Boyesen. Be sure to use a new gasket when putting your new cover on. Good fit.The reason I gave it 3 stars is it does not use the OEM o-ring for the gasket seal.You need a replacement from Boyesen if ever removed.It is a paper gasket. looks great. better priced here on rocky mountain than boyesen themselves. gives it a factory look. Order to replace stock clutch cover thinking this would be more solid/durable. To begin with it came with a cheap looking gasket instead of o-ring like the oem cover uses. After installing the part (torqued to spec) the bike began to like oil which it did not do before with the oem cover that was patched up with JB Weld. I never rode the bike after installing cover, it just sat for a week and I noticed it was leaking. I could only imagine the severity of the leak if the motor was hot. For the price I would expect a better quality product. Very disappointed!! Perfect fit. Looks way better than the old scuffed up stock cover. Just hope it holds up well. Go with a cover that uses the oem style gasket. does the oil capacity stay the same with this or does it change from oem? BEST ANSWER: Oil capacity stays the same. The cover is same size as stock just alot nicer looking. Yes, the oil capacity of the bike remained the same. 2008 honda CRF450R. Oil capacity remains the same. 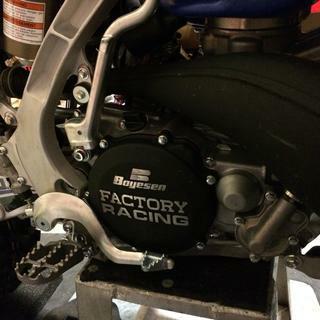 Does the Boyesen clutch cover come with gasket? BEST ANSWER: For my 05 crf450r it did come with the gasket. Does this come with a gasket ? BEST ANSWER: Yes this does come with the required gasket. Note, on my CRF450R, instead of a paper gasket it came with a rubber O-Ring. If you have to replace, the OEM gasket would not work. No. You need to use your oem gasket. This fits just like the stock clutch cover fits, so if the stock one works with the rekluse clutch then this one will too. Best to direct your questions directly to rekluse for an accurate answer. Not sure, the Rekluse clutch cover is more squared off at the edges. 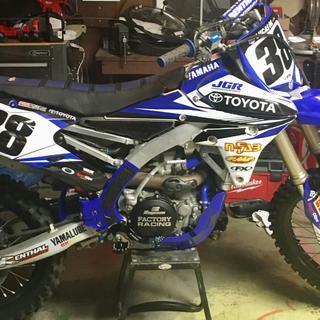 Does this cover have the oil check bolt for a YZ125? BEST ANSWER: Does this cover fit on my 2004 crf250r ?? does this product hold more oil then the oem? Does this cover have the hole to pass the rear brake spring hook into for my 07 KTM300XC? Do you have this in Silver Vein for an 05 trx450r? BEST ANSWER: Unfortunately, we only have this in black for your machine.